What were the key success factors for Arogya Parivar, a bottom-of-the-pyramid initiative by Swiss pharmaceutical major Novartis? In this article, Meenakshee Sinha and Professor S. Arunachalam present a replicable fast-moving consumer good blueprint for rural marketing based on the Arogya Parivar experience. In the past century, scientific breakthroughs and economic development enabled pharmaceutical firms to seize the opportunity of providing medical treatment for a range of ailments varying from microbial infections to genetic disorders. Aside from research and development (R&D)-focused pharmaceutical firms, even generic companies benefited from the ever-increasing demand for affordable medicines. Until the last decade, with scope for differentiation, R&D was both feasible and affordable and the industry grew exponentially. The Indian pharmaceutical sector, primarily comprising generic firms, also performed well above market average. Figure 1 compares the NIFTY 50 and NIFTY Pharma from January 2010 till May 2018 in India. A head-to-head comparison highlights the superior performance of the pharma Index over NIFTY, especially before 2015. The post-2015 trajectory merits more discussion below. However, the contribution of the pharmaceutical sector has gone beyond profit-making. During 2002 to 2012, generic firms also played a significant role in lowering drug prices for diseases like HIV and in increasing access (Check Hayden 2014). However, with increasing pricing regulation aimed at improving healthcare access, pricing turned competitive and multiple companies started targeting the same disease conditions. The effect was quite evident on Indian pharmaceuticals too. They saw a steady decline in margins, from 2015 onwards, as Figure 1 suggests. The gradual increase in competition and complexity of ailments, coupled with declining margins, turned both the feasibility and cost of drug discovery and development into a challenge. Some of the major incumbents initially sought to overcome these challenges through major acquisitions and consolidation. However, the underlying issues remained. A few major paths remain available to pharmaceutical firms. Among these are a differentiation route or a cost leadership route. The former requires work with rare diseases that defy economic feasibility considerations for R&D investment. The latter focuses on improving market penetration of existing drugs. At least a few incumbents in the industry are now looking at highly differentiated and specific offerings to patients at a premium cost. The introduction of some of the latest cell and gene therapy based products is a testament to this trend. An example is the CAR-T therapy, a novel Food and Drug Administration (FDA)-approved approach to cancer treatment introduced by Novartis. However, not all incumbents, especially generic companies, can afford to take the same path, given that they are still struggling with new molecule R&D. While investing in R&D would be essential for the long term, improving market penetration could emerge as the survival strategy in the short term for generic pharmaceutical manufacturers. Some pharmaceutical firms have also made attempts to diversify into complementary channels such as consumer healthcare and wellness products or services. What Next for Generic Pharma? With increasing disposable incomes and health awareness, rural markets offer untapped potential for generic pharmaceuticals. We propose that the capability to develop self-sustaining business models in emerging markets and to create barriers for new entrants will be key strategic advantages, alongside the opportunity to be the first mover. The unique learning curves in rural markets require long gestational timelines and hence are difficult to replicate. Each demographic area needs an individual assessment of product profiles and complementary alliances. Despite the changing context, only Big Pharma plans to expand its reach into rural India (Altstedter 2017). Most generic firms are still reluctant to enter rural markets. Instead, they continue to focus on term-based Corporate Social Responsibility (CSR) initiatives to serve the rural segment. Of the few incumbents that identified both the opportunity and the need to invest in the problem, Novartis took the plunge in 2009. The Swiss pharmaceutical major has been successful in developing a for-profit, self-sustainable model called Arogya Parivar.¹ Arogya Parivar was a pioneering initiative for social business at Novartis. One of the most successful bottom-of-the-pyramid initiatives, Arogya Parivar deployed a two-legged approach. The programme laid equal focus on creating and tapping demand. The success of Arogya Parivar is evidenced by the fact that Novartis broke even in just 30 months.² With successful operations in 11 states across India, the programme has now been made part of Novartis’ global strategy and has been replicated and adapted in local markets in Kenya and Vietnam. The concept was escalated to a global platform with the launch of Novartis Access in 2015. An extremely desirable outcome of this programme has been the exponential increase in opportunities Novartis has made available in rural India. Arogya Parivar has provided jobs, income and skill enhancements to health supervisors and health educators. Limited infrastructure and the paucity of talent are the two major barriers that limit market penetration in Indian rural markets, as Figure 2 shows. These barriers may paint rural markets as an unprofitable segment for generic players, who have been focusing on competing in regulated markets based on cost. However, as stronger price control and regulations gradually erode their margins in regulated markets, generic players may consider developing and capturing the huge untapped potential of rural markets. 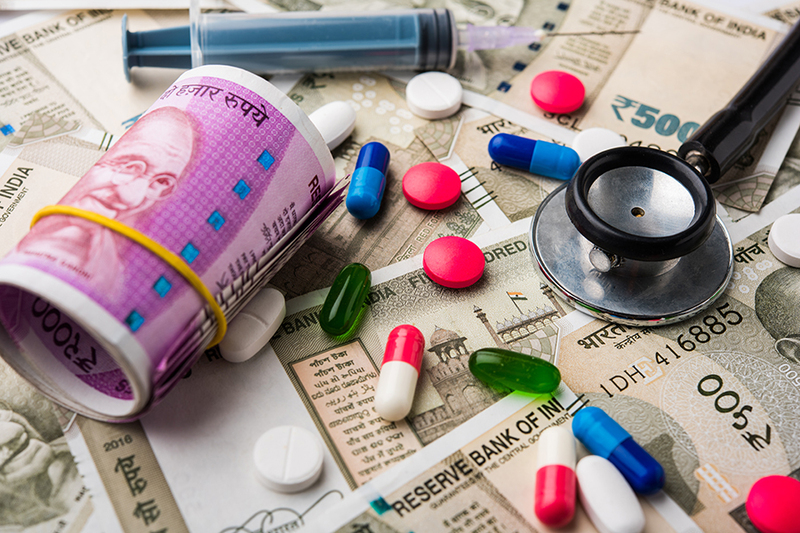 With the growth in incomes, increasing health awareness and greater penetration, the rural contribution to total pharma revenue is expected to grow from 20% to approximately 25% by 2020, according to a 2011 report by India Infoline. It could prove to be a key revenue driver in the near future. Also, government initiatives such as the National Health Protection Scheme (NHPS) and Smart Cities Mission could provide key support. The Smart Cities Mission, for example, focuses on upgrading some of the Tier 2 cities, which have hitherto only been inventory management centres for pharma companies or rural primary care centres. The progress of FMCG companies and Arogya Parivar in rural markets can provide insights to other pharma companies for overcoming structural barriers. While the nature, delivery and consumption of pharmaceuticals is very different from consumer goods, both require a change in consumer mindsets from a need-based lifestyle. In other words, they require a switch from the most economical to the most utilitarian products. Focus on using village level entrepreneurs (VLEs) or personnel as key information sources for extracting consumer-related data and disseminating product details. Focus on creating and highlighting positive externalities such as employment and improved quality of life, among others. While the first similarity enables firms to build reliable relationships at the local level, the second similarity ensures sustainability for the initiative. FMCG’s rural marketing lessons highlight that in addition to fulfilling consumer needs and aspirations, FMCG products also need to fit into consumers’ lifestyles. For example, rural consumers who wash clothes in a common pool or a public water body may prefer plastic sachets instead of paper carton packs to prevent wastage of detergent. We also know that while rural consumers are happy to pay a premium for fragrant detergents for special occasions, the product needs to be offered in affordable packs that meet usage patterns. The product also needs to adapt well to demographic, environmental and cultural challenges. For example, a good detergent should be effective even when used with hard water. Fulfilling a product’s perceived utility establishes trust. Trust can also be enhanced by word of mouth from reliable sources such as VLEs. Unlike urban consumers, rural consumers prefer to avoid switching costs and experiment less. They tend to be loyal to satisfactory products and less likely to switch to a competitor product in the absence of any significant incentive On the other hand, a dissatisfied rural consumer may directly switch to an alternative without sharing feedback. Hence, the extent of a rural consumer’s trust in the product is the key to a firm’s market share. Arogya Parivar seems to have captured some of these insights to establish trust through its 5D strategy. The 5D stands for Dignity, Demand, Development, Design, and Distribution. Novartis consciously decided to move away from CSR-focused initiatives for two reasons. First, CSR initiatives were dependent on the firm’s financial status. Second, rural consumers trusted other alternatives to be more effective than the free medicines provided by CSR initiatives. Arogya Parivar designed an effective product portfolio that included fast-acting drugs in affordable pack sizes. For distribution, they mapped each village to the nearest pharmacy and made attempts to track the patient’s complete journey from referral to purchase. These features aimed to create trust in rural consumers regarding the efficacy and availability of Arogya Parivar products. Strategy, however, was only one part of the equation. Without ground support, it would be impossible to serve the needs of customers on a scale necessary to keep operations sustainable and profitable. Arogya Parivar was focused on increasing the availability of Novartis medicines in the local stores. The greatest challenge was distribution to the arteries and veins of the vast country-wide distribution network i.e., to Tier 3 and Tier 4 towns. Arogya Parivar employed a third-party pharmaceutical company, which had its own sales team in the region to overcome the distribution challenge. This was an effective solution since the team spoke the local language, possessed a better understanding of consumer behaviour in the region and was, therefore, able to earn the trust of the people. Identifying and leveraging the role of alliances and partnerships in making the initiative self-sustaining and ecosystem-focused was also critical. The Arogya Parivar initiative was strongly supported by Novartis’ existing partnerships with over 54,000 doctors and pharmacists. These are major influencers in rural regions. The success of the 5D programme can be gauged by the fact that since 2007, Arogya Parivar sales have increased 25-fold, according to Novartis. The idea of creating trust before market share has proved critical in this success story. FMCG marketing has consciously motivated rural consumers to either purchase cost-focused products or to aspire for more ‘urban’ products for occasional purchase, in their primary basket. Cost-focused product sales are usually high volume and bring in stable profits even at low margins. On the other hand, premium products survive small sales volumes and seasonal variability through additional margins. Medical products, given their very nature, do not fall in either of the above categories. Most, if not all, cannot generate high volume sales, and most of them, being under the National List of Essential Medicines (NLEM), cannot be priced at premium margins. This has been one of the key challenges that restricted pharma from creating alternative distribution channels as easily as FMCG or in replicating distribution strategies from FMCG. Novartis’ strategy offers a great amalgamation of the FMCG strategies discussed above. The product is positioned as an essential commodity but instead of lowering the margins, affordable packs are offered. While the ‘essential’ tag helps stabilise and sustain the demand, they earn similar margins in both rural and urban settings. With the variability in sales being the biggest challenge, Novartis took a step back. Instead of normalising sales, it focused on stabilising demand. Arogya Parivar tried to place medicines in the essential basket by motivating the consumer to look at medicines as a necessity rather than an aspirational or privileged commodity. With the help of Arogya Health Educators (AHE), the programme educated consumers about prevalent diseases, their causes and symptoms. It disseminated the message that seeking medical help early could reduce the loss of working days. Alongside scientific communications designed to educate physicians about the better clinical efficacy of Novartis’ branded drugs, Arogya Parivar developed short stories in at least six different languages to convey these ideas to consumers. They trained their AHEs on 16 parameters, such as tone and speed, to ensure that information was shared in a standard format and was effectively understood. The initiative even conducted follow-up sessions with short questionnaires designed to identify if the key takeaways had been well understood. The initiative also created incentives for consumers to opt out of the traditional ineffective and superstitious methods of health management. Novartis overcame structural barriers in rural markets mainly due to its leadership commitment, its investment capabilities and an incentive structure for internal stakeholders that ensured internal support and motivation. Apart from these firm-specific strengths, we believe that the focus on building trust and motivating consumers to adopt medicines as an essential everyday commodity helped Novartis succeed in rural markets. Hence, these should be the two overarching lessons for any pharmaceutical marketing initiative aimed at capturing the true potential of rural markets. We believe Arogya Parivar truly is an exemplary case. It highlights how even an R&D heavy sector such as pharmaceuticals can adopt insights from FMCG rural strategies to design and develop their own rural success stories. 1. This article draws on a study that was conducted as part of the Marketing Strategy Course at the Indian School of Business. The insights described here were gained during interviews with former Novartis and MART team employees, who were closely associated with the initiative. The authors would like to thank the interviewees for graciously sharing their experiences and learnings. 2. “Arogya Parivar broke even in less than three years and has been sustainable ever since, meeting both its commercial and social targets”, according to Novartis (2017:7).